As an office massage therapy team, we do hundreds of corporate massages. And although the businesses differ and the employees change, the same symptoms of pain are synonymous. We are always asked to reduce pain in 3 main places: neck, shoulders and mid back, and lower back. Very rarely do pain sectors show up in other places when we do corporate massage. 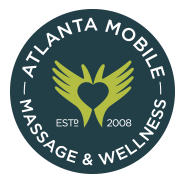 So, Atlanta Mobile Massage and Wellness has become experts on reducing pain in these areas. Why is pain found specifically in these regions and what can you do to reduce pain while working at a desk? Stand and hold your dominant arm up at a 45-degree angle. Take your less dominant arm and sidle it up alongside your body and hold in relaxation. Count to 50 seconds and then assess how your body feels. Your dominant arm at the shoulder joint is likely already burning and feeling tired. However, the less dominant arm is still able to be held. This represents good vs bad ergonomics, muscles holding the arm in place vs the bones. This is what is happening with your body hour after hour, day in and day out, week after week, and it is this that causes chronic pain. It is only through movement, correct ergonomics, and awareness that you can ultimately reduce, and maybe even eliminate, your pain. Pain is the body’s way of saying please pay attention to me, something is not okay. However, in today’s modern world, we treat symptoms instead of causes, and most people simply take a pain killer or live with the pain believing it to be normal. The good news is that you can choose something different. Use good ergonomics, move your body every 45 minutes to hour, walk around your office, stretch. With the combined healing prescriptions, you will find yourself feeling better as the pain is reduced. Because we all know how we feel when we are in physical pain- uncomfortable, short tempered, grumpy, unhappy. Through movement and awareness anyone can reduce pain in the workplace.